Archive of the transcript on anime diet. ーーWould you say your music style has changed since you started composing soundtracks? Kajiura: Ever since I started composing soundtracks, the music I create has changed a lot. ーーWhen did your love affair for music begin? Kajiura: When I was in elementary school, I was in the chorus club, and I belonged to the chorus club for a long time, and so the first song I composed was a chorus piece. ーーWhen you first started your musical projects, where did you look for your inspiration? Kajiura: By “project” do you mean FictionJunction? Umm, it depends on the songs, I don’t have any pre-decided place to search. ーーWhat inspired you to form Kalafina? Kajiura: For Kalafina, I wanted to make focused (lit. “narrow”) music. For FictionJunction, I have to try everything I come up with; for Kalafina, I only want to try what Kalafina is supposed to sound like. ーーYou tweeted that you’re a big fan of the Beatles. Who are your favorite bands and composers through history? Kajiura: There are too many to narrow it down, but I like Paul McCartney the most from the Beatles. I love Paul’s songs. And I also like Queen, ABBA, Mike Oldfield. ーーAny other composers who inspire you? Kajiura: If you say composers, I think Paul McCartney and Mike Oldfield are composers as well, But I don’t have a certain composer that I feel “this one,” since there are a lot of composers. I think I’m influenced by a little bit of everything. ーーAre there any future projects that you can tell us about? Kajiura: There’s nothing I can talk about. ーーMany of the shows you’ve scored have a strong Gothic overtone. (Petit Cosette, Kara no Kyoukai, Fate/Zero, Madoka, the costumes of Kalafina) Are you drawn to that genre of anime in particular and if so, how so? Kajiura: Is it gothic? I wonder Madoka and Fate/Zero are categorized as gothic, but I am certain that those shows are written in a dark and deep world. Yet, I don’t get offers to compose for anime that are merry and happy. ーーQuestion for Wakana and Keiko who are both in Kalafina and FictionJunction. What would you say is the key differences between the two bands? ーーKajiura-san, in 2003 you did a concert at AX. What is it like to come back in 2012? Kajiura: When I did the concert in 2003, it wasn’t a full band. So, this time, I can bring all the members of the Yuki Kajiura live band, as we always do in Japan, so I think it will be very exciting. ーーCould you tell me more about your Latin style chant music? What inspired you to create that sound, which is such a striking and iconic sound for you? What was your inspiration and where did it come from? Kajiura: I only wrote one real Latin song (“Salva Nos”). But I use a lot of artificial language. I have huge fun creating songs with an artificial language because artificial language can make the melody stand out. ーーYou were involved a lot with studio BEE Train. How did you get involved with BEE Train, and do you want to write music for “girls with guns” show again? Kajiura: When I first worked with BEE Train, director Koichi Mashimo was the one asked me to work for the project. This first anime soundtrack I had worked on [with him] was “Eatman” (1997). And since then, because of that, Mashimo has asked me often to work on his projects. Of course, I want to make music for a “girls with guns” show again if I have a chance. ーーWhat is the most important element in composing music for anime? Kajiura: The BGM and the scene have to match. I think basically BGM should be put behind the scenery. It’s not the character, but if it matches the character’s worldview, I always think that will be the music will make the anime’s worldview colorful effectively. ーーFor Kajiura: J-pop is popular around the world, and your anime music is known internationally. How do you feel about that? Kajiura: As a musician myself, I think Japanese animation is a very interesting field that can experiment with a lot of things. So, I’m very proud as a Japanese person that people around the world are paying attention to anime and watching it. It’s an honor to be part of it if my music can help people around the world to enjoy anime. I receive a lot of emails from various types of people around the globe through my homepage and website. It warms my heart when I realize how many people around the world are watching anime. ーーHow do you get to know all these talented people? Kajiura: It’s really difficult to find the right singers. 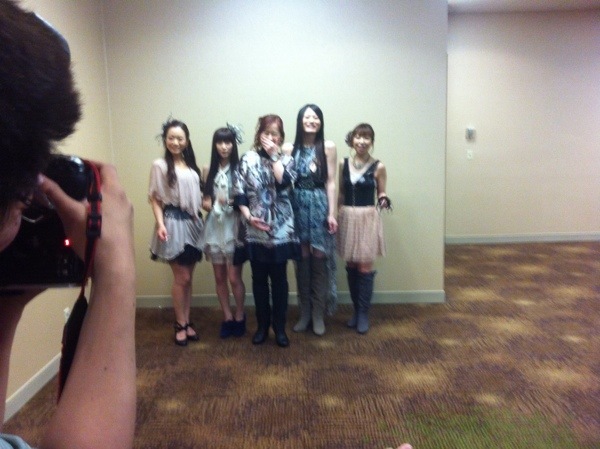 And a lot of people introduced these singers to me, then I had finally made it to meet them. Everyone is so different and unique as a singer, but all of them are my ideal singers. ーーWas there any soundtrack that you found difficult to compose? Kajiura: I had gotten an offer to compose for Mai-HiME. When I received it at first, I was worried if I could make music for such a cute show. But by the end, when the story turned out to be very scary, I didn’t get confused when I started writing the music. ーーHow is it working with each other as FictionJunction? Yuriko: I usually sing with a chorus, but I haven’t done much with a quartet, so it’s good to sing together with 4 of us solidly. I feel like I can get a young power and strive, so I’m enjoying doing this. ーーWhat kind of composer do you want to be remembered as? Kajiura: First of all, I really love doing anime music, I love doing BGM and soundtracks. Composing music along with motion pictures is a very exciting thing, so if I can, I want to be remembered as a soundtrack composer. ーーAre you fan of anime, and do you have any favorite songs that you composed for anime? Kajiura: I have several; I liked the Mushishi manga, and when it was animated, it perfectly matched the manga, so I bought the DVD collection for the first time. And a few years ago, Gurren Lagann was airing in the morning, and it was a good, very energetic anime that invigorated me every day, and I kept saying, “I liked it I liked it,” and so I got the DVD as a gift and I watched it all. ーーFor FictionJunction: what music have you listened to that energizes you? Yuriko: Lately I like Genki Rockets, and I listen to them often, and I get energy from them. ーーWhen you hear other soundtracks, do you ever think “I can do different”? Kajiura: It’s rare for me to listen to other soundtracks negatively like “I would have done it differently.” But I study soundtracks by listening to various kinds of soundtracks. ーーHow is writing music for Gen Urobuchi (Fate/Zero, Madoka)’s stories different from other works when you do soundtracks? Kajiura: Urobuchi-san’s stories are very compelling, and they have the power to entrap me. Rather than saying his works are different, his works seem ready-made to write songs smoothly. There is a certain constant rhythm in his scenarios; I can clearly see that here is the climax, and here is the blablabla, and I just need to put music to that part: so it’s makes it easy to find musical inspiration for each scene.